I am now two weeks in to #sketchbookskool #stretching class. Great to be back in class again! The time is already flying by. This second week I skipped over the blind contour and went straight to drawing big heads. It’s harder than one would think! I need to try this assignment again with a live subject. Reggie the boxer was hanging out at Java Joe’s coffee shop in Sugarloaf, he was a great looking guy–so I snapped his photo. The drawing is kind of wonky and I think that I will re-do his tag, but he was super fun to draw. The think I like most about this assignment was the feeling of freedom from changing the proportions. Figures can be so intimidating…and changing proportions somehow takes some of the fear out of the drawing. 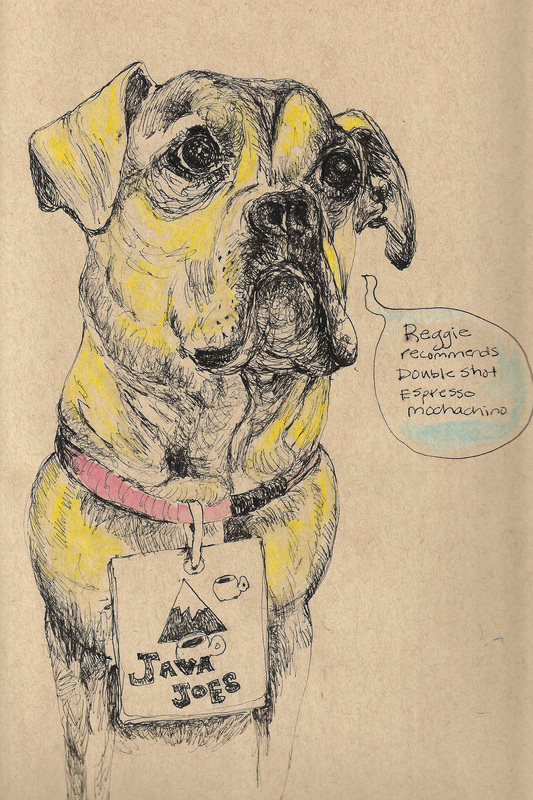 This entry was posted in #sketchbookskool, animal, art journal, dog, drawing, ink pen and tagged #sketchbookskol, art journal, artist, Big Head, Coffee Shop, dog, sketch. Bookmark the permalink. thanks Karen! I am really liking the tinted paper–it has a smooth surface that the ink pen likes. I need to find it in a heavier weight for the wet media.